We’re always excited for the next generation of Jeeps here at Freedom Jeep Chrysler, and 2019 promises to be groundbreaking. The new models of Wrangler, Cherokee, and Compass provide big updates to classic Jeep performance, and the rumored addition of the Jeep Scrambler (a Jeep pickup truck!) could change the industry. Check out the future of Jeep below, and make sure to stop by Freedom Jeep Chrysler – we’re always thrilled to talk shop with other Jeep enthusiasts! The 2018 Jeep Wrangler received a top-to-bottom upgrade for every facet of performance. The 2019 Wrangler displays even more improvements for this iconic classic. New powerplant options are available for the new model year: the 3.6-liter V6 with eTorque, and the 3.0-liter turbodiesel V6. The 2019 Wrangler also includes adaptive cruise control and forward collision warning for increased safety. New color options are available to add even more style to the incredible off-road capability of the 2019 Wrangler. It’s only the third model year for the Jeep Compass, but it’s made an unmistakable impact on the crowded SUV landscape. The 2019 Jeep Compass adds new trim options, including an “Upland” package that arms your Compass with 17-inch wheels that were previously only available in the Trailhawk package. The new “High Altitude Appearance” option supplies you with 19-inch wheels, an improved Uconnect touchscreen, and a host of exterior upgrades for a more luxurious presentation. Jeep has also added the Adaptive Cruise Control in the Compass to improve safety. 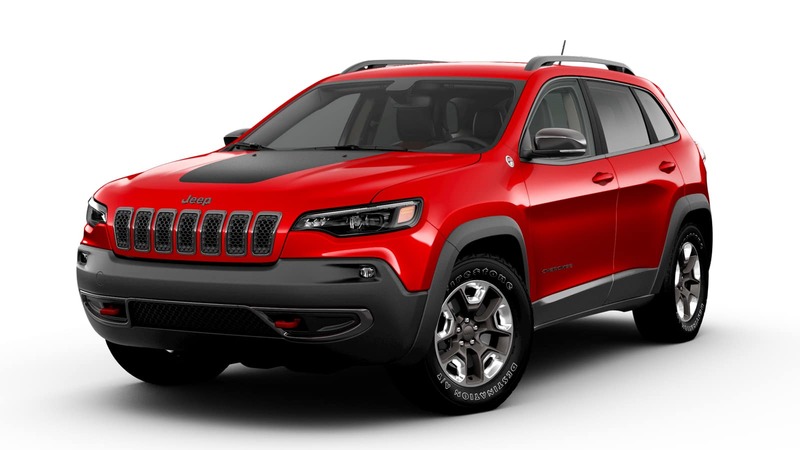 The 2019 Jeep Cherokee – available today from Freedom Jeep Chrysler – brings in the new model year with revisions to the front end and tailgate. New taillamp styling adds a dynamic twist to the classic Cherokee look. The interior receives further refinement with meticulously crafted leather-trimmed seats that differ for every package. And renowned Jeep power shines through on the 2019 Cherokee’s engine options: the 2.4L Tigershark®️ MultiAir®️ 2, the 3.2L Pentastar®️ V6, the 2.0L Turbo Engine, and the 3.2L Pentastar®️ V6, which tops out the line with 271 horsepower. Rumors of a Jeep pickup truck have existed for years, and Jeep has even assembled a few demonstration vehicles to show the world how it might look. But increased sightings, a few stolen photos, and insider information lead us to believe that the 2019 Jeep Scrambler is truly on the way. This mid-size pickup based on the Wrangler is poised to compete with other mid-size trucks in the coming year. We can’t wait to see the Scrambler in action! Be sure to check out the coming 2019 lineup at Freedom Jeep Chrysler today! 0 comment(s) so far on 2019 Jeep Lineup Preview!